On my design wall are the four trees I made for the Block-of-the-Month with Jennings Community Church. The other finished blocks can be seen HERE. This week I plan to work on costumes for Robin Hood The Courtship of Alan A'Dale. The Boybarian is in the cast and Princess Sunshine is working with the Crew backstage. 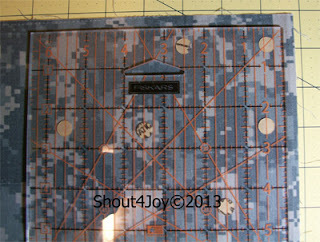 I'm thinking not much quilting is going to happen for the next two weeks! Check out Patchwork Times for more Design Wall inspiration! 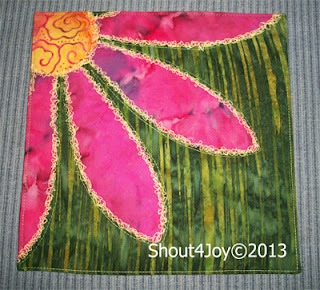 Project Quilting's last challenge for Season 4 was Hurray for Spring! I spent a lot of time thinking on Spring this week while being the homeschool mom who taxis her children from place to place. Does your fabric tell you what you can and cannot do to it? Mine obviously does. It almost was screaming at me when I got the different design ideas together and started pulling coordinating fabrics! SO, the fabric told me I needed a new purse :) My current purse is made from denim and a lovely paisley that is fairly dark. 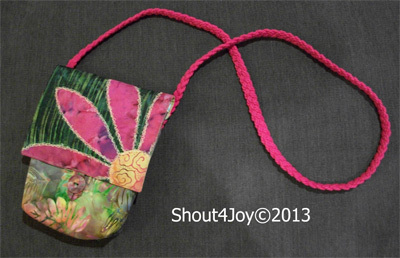 So, I should have a bright and happy purse for spring. I'm a fan of small purses, so I pulled the Mini Messenger Bag pattern and started to work on the flap :) I pulled a lovely green that reminded me of grass, found a great gold and a pink for the flower and drew out my shapes on the paper-backed fusible web. I fused the shapes and then scribble stitched the flower down, quilting it in the process. 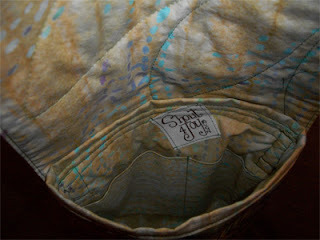 I added a divided interior pocket. 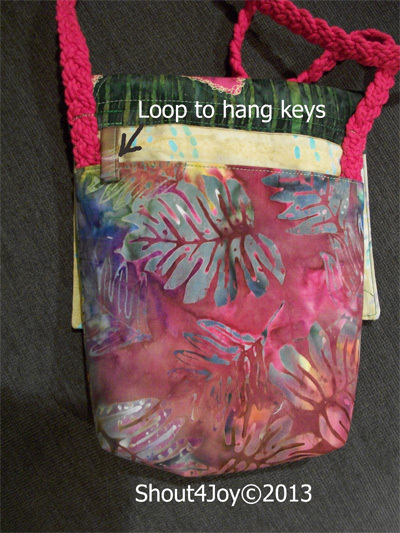 I also added a back pocket and a loop to hang my keys. 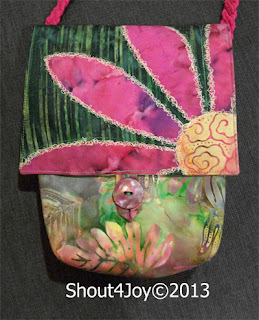 This purse is going to make my day brighter as I use it - I'll smile at the happy flower and the lovely batik! Here is the finished quilt, hanging up at the quilt guild meeting :) I had a lot of compliments on the quilt, and I'm so glad I got it done (though if our challenge quilts make it into the show, I'll be putting on the hanging sleeve as well as blocking it properly). Yes, I hope to get better photos later ... 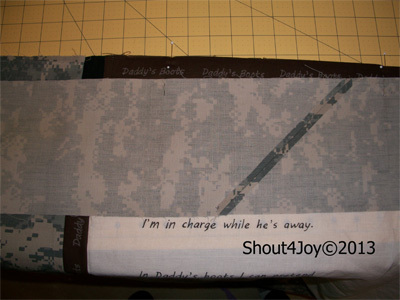 I was working on this right up to the minute I left for quilt guild and didn't get a chance to snap a good shot. 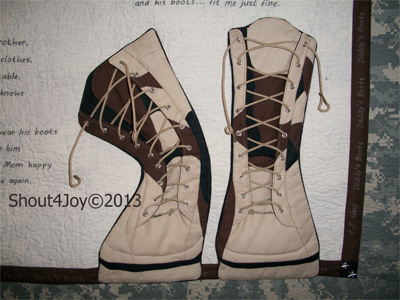 I'm very excited about how the boots turned out. 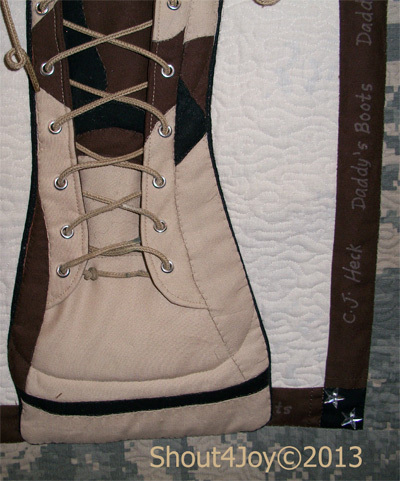 And the laces came from the Army Guy's boots, so they are authentic Army laces (he gave them to me, I didn't just take them!) - they just make the boots come alive! And together with the borders made from old uniforms - it just makes me happy. Along with putting the poem's name in the border, I also made sure that I didn't leave the poet out. The poem, Daddy's Boots is by C.J. Heck and can be found HERE. 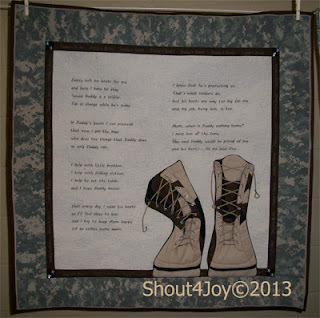 The author has graciously given permission to use the poem for this quilt. 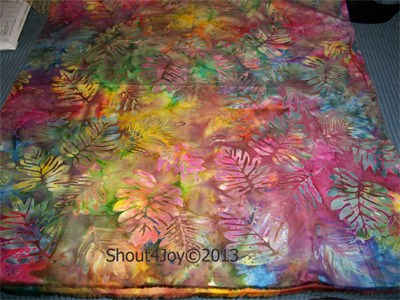 I always measure my borders to the size of the middle of the quilt. 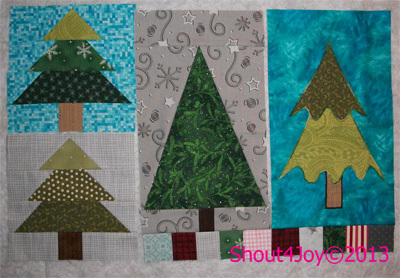 I do not just sew and trim as I have had enough experience with wavy borders on quilts where they stretched when sewn on! After measuring, I find the half and quarter along each edge and pin the border on. 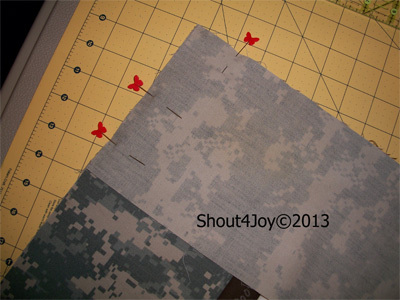 Before I sew, I also pin the edge of the border to help keep it square. 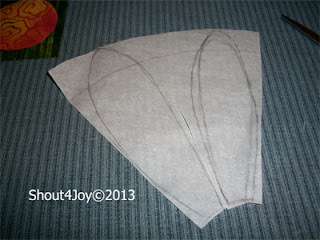 When I skip this step, it seems that the corners on my borders become more acute an angle and I don't want that! 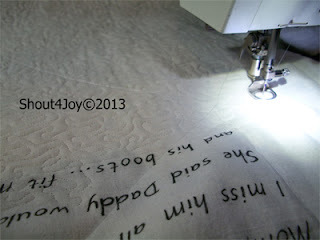 Tomorrow I plan to post the finished pictures ... I did get the quilt finished (still need to attach the hanging sleeve, but will only do it if our guild's challenge makes it into the quilt show).